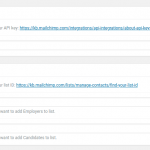 MailChimp Integration allows you to automatically add newly registered candidates and employers to your MailChimp mailing lists. After installation and configuration, the WPJobBoard registration forms will have a GDPR compatible “signup for newsletter” checkbox which will allow users to subscribe to MailChimp list. You can use the created mailing list to increase your earnings and revenue by sending to the users offers and promotions which will encourage them to invest more into the job board by posting a job or purchasing a subscription. Have a GDPR compatible newsletter signup. Send newsletters, promotions and other offers using the state of the art MailChimp software. Login to client panel and download the WPJobBoard MailChimp extension. in wp-admin / Plugins / Add New / Upload panel upload and activate the MailChimp Integration downloaded from client panel. 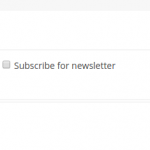 Signup for MailChimp account (and API key) and create one or more mailing list. Configure API key and mailing list ids from wp-admin / Settings (WPJB) / MailChimp Integration panel.